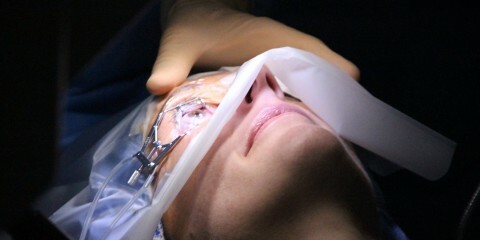 Lasik, fear no more, just do it! Esteban Alejandro is 12 years old and lives with his parents in Villavicencio, Colombia. He’s a cheerful, clever boy, pretty social too. There doesn’t seem to be a subject he doesn’t feel comfortable with. He understands all too well that our Spanish isn’t perfect and switches to English without a hiccup when he notices we don’t understand some of the words he or his parents are using. We have spent a great afternoon together with the family and they are so proud to show us the nicest places of their city. Meeting these lovely, hospitable people was just amazing. How did you discover you have Duchenne muscular dystrophy (DMD)? When I was about 4 years old, there was a quite noticeable difference with other kids of my age. I was unable to walk properly and I didn’t have any strength in my legs. My parents decided to take me to child neurologist Alvaro Izquierdo in Bogotá and he immediately recognized the Duchenne symptoms. But the first two tests appeared to be negative because usually the disease is transmitted from mother to son. In my case however, the genetic mutation was not inherited from my mom, but it’s a spontaneous de novo mutation. I was 11 years old when they did a third, more advanced test – a study with next-generation sequencing to detect mutations in genes and to identify deletions and duplications. After this test, I was diagnosed with DMD, Exon 21. At the age of 8, I was tiptoeing more and more and when I was 9, I got my first wheelchair. Last year I got two different electrical wheel chairs which have made my life a lot easier. How does your life compare to that of other children your age? Well, the only real difference is that I am unable to walk. Apart from that, I am just one of them. I go to a regular school where I perform pretty well: I am always among the top 5 best students of my class. For the last period I even came out second of the whole group! Chemistry, biology and geography are my favorite classes. But at school there is a nurse who helps me when needed. I get physiotherapy once a week which focusses mainly on keeping my muscles supple. Two times a week I get hydrotherapy for the same reason. 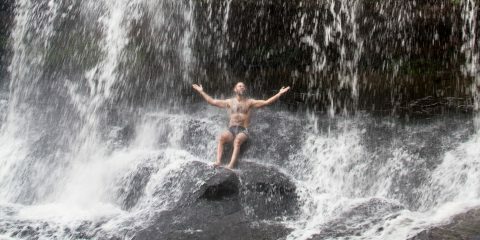 I praise myself lucky to love water and swimming that much. Most boys don’t like that, which makes it a lot more difficult to work out properly. For me, water therapy is pure relaxation. I also often go to the hospital for tests. The cardiologist, endocrinologist, gastrologist, neurologist, pulmonologist, dermatologist, physical therapist, orthodontist … They all need to see me. I also wear a brace, because my teeth got deformed due to Duchenne. How do your friends cope with the disease? I study at the same college for more than 8 years now, so my friends knew me before I ended up in a wheelchair 3 years ago. From the moment I couldn’t walk anymore, they (and my teachers) always helped me a lot. They don’t treat me differently from others and I try to act just like the others as much as possible. I just find it a bit annoying when they start asking questions like ‘when will you be able to walk again?’. I rather don’t answer those because it’s pretty darn difficult to explain to someone that doesn’t know anything about the disease. How did Duchenne impact your family? The impact was huge. There is no doubt about that. It turned our world upside down. Especially on the financial level, a lot has changed. Because we had to go see doctors in Bogotá so often, we both had to quit our jobs 2 years ago. Taking care of Esteban Alejandro requires a lot of time and energy and combining that with a full time job is hard. But we praise ourselves lucky to get support from Sanitas, a Colombian health care center, and financial help from our family. We are a catholic family that always clings together. We get a lot of support from each other and from our prayers. These prayers are crucial to us because we are convinced they have a positive effect on the health of our son. The disease is pretty unknown in Colombia. Few people heard about it and we had to look up a lot of information on the internet ourselves. Most doctors don’t even know how to treat Duchenne or what therapies are at hand. Through the internet and after many discussions with our doctor in Bogotá, we discovered alternative medicines that slow down the evolution of the disease. Since 2017, Esteban uses a natural medicine called ParActin which contains extracts of Andrographis Paniculata. We, and the doctors too, think his condition has improved a lot. We are also involved in CRISPR/Cas9, a technique altering DNA. We strongly believe in this technique and of course we would do anything to help our son. We now know nutrition has a major impact on our sons health. We try to eat healthy food with lots of fruits and vegetables and less meat. We try to make sure he gets his dose of calcium so we make him drink a lot of milk and yoghurt. By doing so, we also notice a positive effect on his condition. In Villavicencio, there’s 9 other kids with DMD. 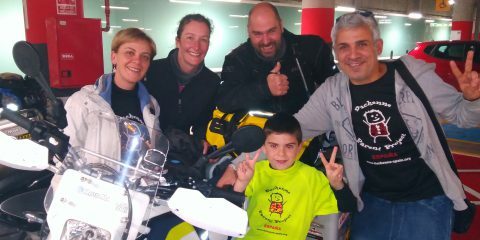 We find comfort and support with the other families and with the Fundación Duchenne. We are lucky to live in a hot climate because it’s better for our son’s lungs. I would like to study. I like architecture, molecular biology and photography a lot and I would like to do something in these areas. I also would like to travel as much as possible, because discovering other countries is my passion. I already look up a lot on Google Maps and I have been traveling before. We went to Disney World in the United States. Even flying wasn’t a problem for me: they had a customized wheelchair there and they took really good care of me. Furthermore I am a big Apple fan, so yes, an iPhone is also one of my dreams. What more would you like to say to other people?